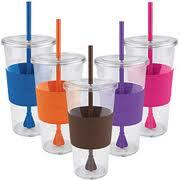 Reusable double walled acrylic cups with screw on lid and straw. Holds approximately 16oz. Do not use in microwave or dishwasher. Cups and Mugs Price Qty.